Williamstown Primary School 1183 opened on January 27th 1873 in the Williamstown Mechanics Institute, Electra Street, with Mr James Russell as the school’s first headmaster. To cope with the 310 pupils Mr Russell had the assistance of one female teacher, one male teacher, and two female pupil teachers. 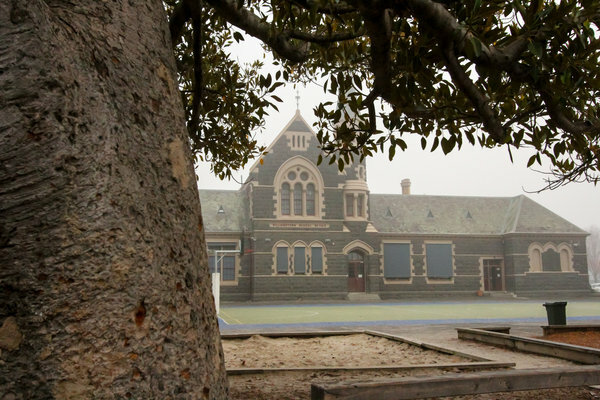 Within weeks the school was overflowing with pupils and arrangements were made for another school to be opened in the district – Williamstown North PS – which opened in July 1874. On July 31st 1874 the Education Department purchased part of the site of the Market Reserve from Williamstown Borough Council. By this time there were over one thousand children enrolled at the school. On December 31st 1876 the Minister for Public Instruction approved plans for the construction of a school in stone or brick to house approximately 800 pupils. Stone was readily available in the district and stone masons still resided in the area. The school proved to be one of the last major stone constructions in the area and the stone used was quarried from the site. The original completion date was November 1877, but alterations and delays meant it did not open until September 3rd 1878. The school was enormously important to the community. Local tradespeople were given a half-day holiday and local schools closed as the community attended the opening ceremony. Military bands entertained the crowds and the Minister for Public Instruction, W Collard Smith, attended. Buildings were decorated with flags and on Market Reserve were merry-go-rounds, shooting galleries as well as lolly and fruit hawkers. The school was considered one of the most stately in the country and a complete model, including all internal fittings, was sent to exhibitions in London and Paris. Within weeks of the school opening two 400 gallon water tanks were sought as water shortages were a problem. A timber fence was requested around the school perimeter to “keep out the local unemployed youths”. 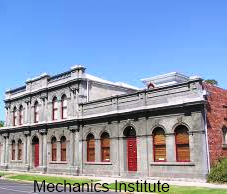 Rain was a problem in winter, with the grounds becoming so waterlogged the School Board of Advice suggested that unless asphalt works were undertaken, they would recommend a return to the Mechanics Institute for the winter months. Conditions at the school were often difficult; there were problems with drainage, sanitation, water supply, ventilation and lighting. Poor drainage caused problems with foundations and flooring, eventually resulting in the destabilization and subsequent demolition of the spire at the Parker Street end of the school. Old inventory records from the time indicate a severe shortage of equipment, much of which was in poor condition. Absenteeism was a problem in the early years of Victorian education, with often less than half of the enrolled students attending. However, by the early 1900s school attendance was much improved and nearly 900 pupils were attending daily, causing severe problems of overcrowding. The School Board sought additional premises and fortunately secured a most suitable structure close by – 52 Pasco Street, a site previously used as a Girls High School. On December 7th 1904 a deputation from the Board of Advice and the local MP, J Lennon, met the Minister and requested that the junior classes attend Newport Primary School. The request was denied, however funding was received for the construction of a junior school, south of the original building. Work commenced in 1905 and the building was opened in 1906. In the 1920’s the Girls Secondary College was established in the redbrick building and the infant grades crowded back into the bluestone building, remaining there until 1962, when the girls’ college relocated to Bayview Street. Click here to access the booklet published to celebrate the school’s 140th anniversary in 2013. And find out about our back-to-school day here. What a success it was! For further information on the history of Williamstown Primary School please contact the State Library of Victoria, the Williamstown Historical Society or On My Door Step.